The 18th edition of Trends in Nanotechnology International Conference (TNT2017) is being launched following the overwhelming success of earlier Nanotechnology Conferences. The TNT2017 edition will take place in TU Dresden Auditorium Center (Dresden, Germany). This high-level scientific meeting series aims to present a broad range of current research in Nanoscience and Nanotechnology as well as related policies (European Commission, etc.) or other kind of initiatives (iNANO, nanoGUNE, MANA, GDR-I, etc.). TNT events have demonstrated that they are particularly effective in transmitting information and establishing contacts among workers in this field. The TNT2017 structure will keep the fundamental features of the previous editions, providing a unique opportunity for broad interaction. 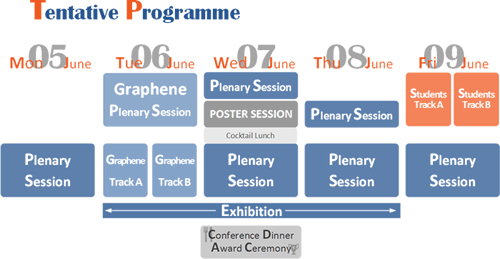 On the occasion of TNT2017 a Graphene one-day Symposium will be organized in collaboration with ICN2 (Spain) and will take place on June 06.